A few different types of seals (Pinnipeds) are common in Cape Cod, Massachusetts. Some live and breed there year-round. Others migrate through on their way elsewhere. We're planning a trip to the Cape specifically for the purpose of seal watching. We'd probably be in the area for about two days. What location or locations, and what time of year, should we choose, in order to get the most sightings? Seals appear at various times in various places on Cape Cod. There isn't a guaranteed time and place to see seals, but some spots are better than others. This is just one subgroup I captured together with a 300 mm lens. There were probably 20-30 total that day at that time at that place. This was on 24 Sep 2013 at 14:46 at 42.05487°N, 70.08457°W. Seels come to this place regularly enough that there are signs posted about what you're allowed to do and not do when seals are present. 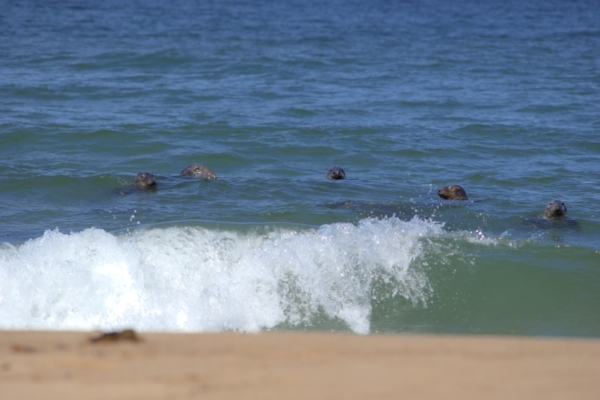 These seals seemed curious, and actually seemed to follow me along the beach. The best time to see seals is within 2 hours of low tide on a sunny midday afternoon. Because seals cannot move well on land, during high tide they position themselves over submerged jetties. When the tide goes out they are left exposed, sitting on the jetty basking in the sun. And according to this page, the best places are along the east side of the hook, with the best being off South Mononomy Island which is reached only by boat tours. Not the answer you're looking for? Browse other questions tagged united-states animals animal-behaviour or ask your own question. When/Where do foxes attack humans?